For almost two centuries architects have molded Newark's skyline, creating buildings that incorporate all manner of popular styles both downtown and on the outskirts. They have produced humble cottages and great mansions, hospitals, banks, factories, churches and synagogues, transportation terminals, schools and colleges, theaters, art galleries, auditoriums, libraries, museums, movie houses and rest homes, even cemeteries. Just look at the influence the New Jersey Performing Arts Center has had in skyrocketing an already dynamic city into the good thoughts of suburbanites, New Jerseyans in general and Americans as a whole as a symbol of Newark's rebirth. One need only walk around town to see some of the best examples of architecture found in any city. While we have lost some very important structures, our building inventory is still full. Two watchdog committees, the Newark Preservation and Landmarks Committee and the Newark Landmarks and Historic Preservation Commission, are dedicated to preserving what we have, and they encourage your interest and support. My first association with Newark almost four decades ago was through my college roommate who came here on a job interview. 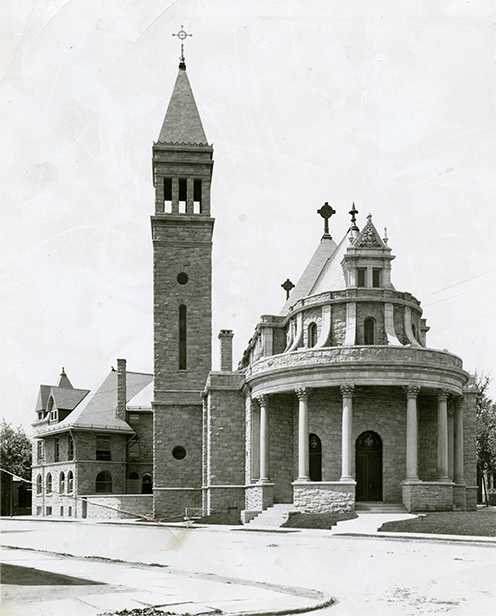 Upon his return to Vanderbilt, he raved not about the position for which he was interviewed and eventually hired, but about the city's chain of churches, which stretched like a string of architectural pearls along Broad Street from the House of Prayer at State Street south to South Park-Calvary Church at Lincoln Park. Much of this information comes from the life-long research and dedication of the late Donald Geyer and the work of Ulana D. Zakalak, a scholar and historical researcher who, through her work with the Newark Preservation and Landmarks Committee, has added many Newark entries to the state and national registers of historic places. Three books which are valuable are 'The Cultural Resources Survey of Downtown Newark'; New Jersey, 1985; Terry Karschner's 'Industrial Newark,' also compiled in 1985 for the 14th annual conference of the Society of Industrial Archeology; and 'A Survey of Ecclesiastical Architecture 1810-1865,' by Kenneth B. Schnall. The architectural notes of Dr. Julia Sabine, longtime head of the Newark Public Library's Art and Music Department, also are a valuable reference tool. Charles Ackerman was architect of St. Nicholas Greek Orthodox Church in High Street, built in 1924 of yellow brick and limestone trim and decorated in Classic Revival with Italian Renaissance spirit. Berthold Audsley, a designer of miniatures, lived in the Roseville section and in England. His house models were widely used by local architects. Henry Baechlin, George Backoff and Frank Grad designed the Salaam Temple (the Mosque Theater, now Symphony Hall), Newark's grand neo-classical huge-columned baroque early concert hall. Backoff was also responsible for Blessed Sacrament Church and Fire Engine House No. 7. Baechlin was born in Newark, designed the neo-classical New Jersey Industrial Office Building, now called Essex Plaza. He also was responsible for the design of the Wiss Building at 665 Broad St. As an office building, 1020 Broad Street, the Symphony Hall building, also was one of Newark's largest community spaces. Eleazar Ball is credited with being the architect-builder of Old First Church between 1787 and 1791, considered one of the most historic congregations in America. Its early ministers were involved in the founding of both Princeton and Yale. Newark architect Orrin Bartlett designed the Bloomfield Municipal building and the Glen Ridge and Montclair public libraries. Grant Behee was supervising architect of the Robert Treat Hotel and the Essex County Hall of Records. James Betelle moved to Newark in 1910 and partnered with Ernest F. Guilbert. He designed Weequahic High School, Newark School of Fine and Industrial Arts, the Essex Club, the Newark Chamber of Commerce building on Branford Place and Columbia High School in South Orange and Maplewood. Frank Bigelow was architect of the Newark City Dispensary at 84 William St. William M. Brown Jr., co-founder of Brown and Hale Architects, the city's first African-American architectural firm, designed 13th Avenue School, Bethany Baptist Church and St. Luke AME Church. Carrere and Hastings of New York City designed the Robert F. Ballantine Gateway in Branch Brook Park of red brick and limestone in the French Renaissance style. The original red- orange tile roof was replaced by shingles of similar color. The gateways provide a grand connection between the Forest Hill section of town and the park. Howard Chapman left his mark on Newark at the Murphy Varnish Works in the Ironbound. He built the largest of the buildings that was to combine Italianate and Richardsonian Romanesque styles. His 1905 building was constructed of steel reinforced concrete. The complex was more than just a varnish works. It provided the industrial community with examples of current industrial designs and provided Newark with fine examples of architecture adapted and simplified for industrial use. Neil J. Convery contributed two great churches to Newark in the pre-Depression days of the late 1920s. St. Lucy's Roman Catholic Church at Sheffield (Ruggerio Plaza) and 7th Avenue is a combination of an Italian Renaissance exterior and interior with some Byzantine. Its interior boasts multi-colored Italian marbles. Convery's other masterpiece is Sacred Heart Church in Vailsburg, completed in 1929. Its two towers, one 140 and the other 100 feet, are area landmarks. The building's style has been described as Spanish and Italian Renaissance with Baroque tendencies. As the largest sanctuary in Newark, excluding the Cathedral, it seats about 2,000. In the 1850s, Caleb Harrison Condit worked on the first of four Mutual Benefit buildings, which stood on the site of today's National Newark Building at 744 Broad St. Thomas Cressey, English-born and educated, worked on the old Ballantine Building at 415 Market St. and a building formerly known as Stoutenberg Department Store, near Broad and Market streets, which some will remember as the Canadian Fur Co. This was a four-story building that had 12 keystone setback windows, some of which are still visible from behind modern-day signs and advertisements. The firm of Dennison and Hirons Associates designed the Federal Trust Building at 24 Commerce St. of yellow brick with limestone trim including blue-and-gold terra cotta. Its 21 stories are basically modern with hints of neo-gothic and neo-classicism. Recently, the building sold in the economic upswing that is beginning to grasp Newark's downtown office building community. Several interesting newspaper clippings and a note from the early 20th century papers of Donald Geyer credit Stephen Denfer, a Paris-born Frenchman, with the design of Old First Church. Living in Paris in the employ of Louis XVI, he supposedly came to America and settled in Newark, where he taught Latin and French in the city's small French-speaking colony for a half-century. He submitted plans for the Georgian church building that housed the mother Presbyterian Church for all of northern New Jersey. Anthony J. De Pace, a Bronx architect known for designing more than 350 churches in New York and New Jersey, drew the designs for St. James Hospital in the Ironbound and the renovation of Essex Catholic High School. Arthur Dillon, also a New York architect, designed the Riverbank Park grandstand in 1931. The modern functional building contains classical lines and spirit and was principally used as baseball grandstand when it was built. In recent times the park was suggested as the site for a new baseball stadium, which is now to be located along Broad Street and McCarter Highway, east of the Library. Charles Edwards designed the French Renaissance and Baroque- styled St. Columba's Church with its Corinthian column semicircular portico. A landmark at Pennsylvania Avenue and Brunswick Street, it is a one-of-a-kind building and is considered most classical in its grandeur.' The building is a copy of Chapel Royal at Versailles with its curved apse, columned entrance and Italian campanile. Eggers and Higgins designed 500 Broad St., which adorns North Reformed Church. It was an earlier home of New Jersey Blue Cross and Shield and contained 100,000 square feet for 700 employees. One of Newark's greatest names in architectural design was the father-and-son team of John H. and Wilson C. Ely. During their lifetimes they designed some of the city's most important and beautiful structures, including the American Insurance Co., the Firemen's Co., the Broadway headquarters of Mutual Benefit, the former New Jersey Historical Society, the Howard Savings Institution, City Hall and the National Newark and Essex Bank Building. The 21-story American Insurance Co., now the Rutgers Law School, and provost's office is best described as neo-Georgian or neo-Colonial, one of the most elegant of the state's 20th century skyscrapers. It is located at 15 Washington St., overlooking Washington Park. The Firemen's Insurance Co., at 10 Park Place, is a 10-story structure built in stages in 1924 and 1928. The great Corinthian colonnade is topped by a granite entablature and balustrade. Its interior is marked by coffered plastered ceilings, and paneling and wainscoting of mahogany. The building has been beautifully restored by Miles Berger. The former 230 Broadway home of the New Jersey Historical Society was completed in 1931. It boasts a Georgian design of red brick and limestone. The old Howard Savings Institution neo-classical structure was distinguished by huge Ionic columns topped with a pediment and was the joint effort of architects Ely, George B. Post and Bruce Boyd. The present 'We Be Kids' sign and enclosure of the great columns is removable. Apparently, the drop ceilings have not permanently harmed the stately ceiling and golden frieze bearing the names of Newark's most substantial banking personalities of the past century. The third home of Mutual Benefit at 300 Broadway was built between 1925 and 1927 in the Renaissance style and later was used as Essex Catholic High School. It is used now as a nursing home. The Elys also designed Newark City Hall between 1902 and 1906. Geyer saw it as 'one of New Jersey's best examples of the beaux-arts influence in American public architecture.' It includes a mansard roof, a rusticated basement and columns and entablatures interlaced with vigorous columns and pilasters. Architecturally, it has been described as early second empire and has been compared favorably with the Baltimore and San Francisco city halls in importance and elegance. The 35-story National Newark and Essex Banking building at 744 Broad Street is the Elys' most important masterpiece. Dominating the city's skyline for more than a half century, it is being prepared for re-entry in the state's prestige real estate market with renovations by the Cogswell Realty Co. Its completion will add to a the solid block of prime office space from Penn Station to the Gateway complex and on to the Prudential buildings on Broad, Halsey and Washington Streets, another sign of the city's rise from near ashes. Fanning and Shaw, architects from Paterson, designed St. Rose of Lima Church at Orange and Humbolt streets, opposite Bathgate Place. The largest church in the Roseville section boasts a 90-foot tower. They also designed St. Francis Xavier Roman Catholic Church at Bloomfield Avenue and Eighth Street, Mt. Carmel Guild at 17 Mulberry St., and the former chancery of the Roman Catholic Archdiocese of Newark, now the Episcopal House of the Diocese of Newark. John Ferguson designed the great Newark Warehouse Co. at Edison Place and McCarter Highway. This massive cement building, completed in 1907, is 362 feet long and 128 feet wide. Originally it was used by the Jersey Central Railroad for transportation purposes. During the last 25 years it has been host to many Newark printing companies and now is an archival storage center. Its massive dimensions demand attention from anybody passing along McCarter Highway or traveling by train. The architect was noted for designing huge industrial and commercial buildings along the East Coast. Fougner and Gautier were the architects and engineers responsible for the Federal Storage Warehouse at Washington and Warren streets, built of buff-colored brick and rising 19 stories, with a penthouse. The building was designed in 1929-30 as a car park for 1,000 vehicles. David S. Gendell of Philadelphia designed the South Baptist Church at 10 East Kinney St., now New Point Baptist Church, in 1850 in the Greek revival style. Its classical exterior features a Doric-columned portico with pediment and its interior has been described as 'dignified and excellent.' The steeple was removed in 1901 as a result of storm damage.